Wondering where you should plan your next date night in Durham? Good news: we’ve got you covered, thanks to, well, all of you. We asked and you answered. Here’s the 13 of the Best Date Night Restaurants in Durham. By far, voted the top pick for a date night restaurant by our readers, Viceroy is classic Indian cuisine meets a British pub. The atmosphere is definitely English Pub with dark wood, high ceilings, and an intimate feel that’s perfect for date night. Offerings include curry and shepherd’s pie. Their drink menu offers unique cocktails, beers, and wine. All of their mixers and syprups are made in-house daily. You come here for the unique cocktails and stay for the food. It feels special anytime we come here and the bartenders are some of the best anywhere. The service and atmosphere are welcoming and cozy without feeling pretentious. The food options range from snackable finger food to a full meal. It’s a perfect spot to stop before or after a show at DPAC. Cocktails range from $11-15. Low alcohol cocktails are available. Large plates range from $15-28. Reservations are available. If you’re looking for a date night away from the hustle and bustle of Downtown, Zweli’s is the perfect spot. You’ll find them in an unsuspecting strip mall off 15-501, but don’t let that fool you. Here you’ll find the the only authentic Zimbabwe restaurant in the country. We recommend the chicken wings, oxtails, and peanut butter collard greens. St. James is one of those fancy restaurants with an exceptional level of service, but not overwhelmingly so. It’s beautifully decorated with an intimate setting. The menu offerings are fresh and do change with the sea. Bar food is offered half price 5-6pm, Tuesday-Friday at the bar. So come grab a drink and some light snacks before your meal. Entrees range from $25-44. Platters range from $19-26. Reservations are available. Housed in the old Book Exchange building in the heart of downtown Durham, Mateo features a menu that blends the flavors of Spain with beloved dishes of the South. The menu consists of small plates with a variety of choices. Don’t know where to start? Just ask your waiter. The wine collection is strong and can be paired perfectly with some of the dishes. This spot is great whether you want a light or full meal. Plates can range from $5-20. Reservations are available. Blink and you’ll miss this spot tucked away beside the Durham Hotel. 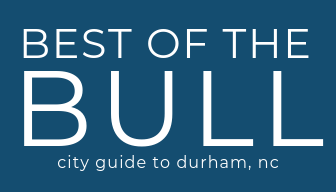 We frequently hear that this is the best spot to get sushi in Durham. M Sushi serves Japanese cuisine based on Omakase, which means Chef’s Choice of the various courses available. Which makes for a unique, exceptional dining experience. (Prices range from $47-$87) Sushi a la carte, rolls, and small plates are also available. Rolls range from $9-$16. Vegan and vegetarian options available. Reservations are available and recommended. Vin Rouge is an authentic French bistro off 9th Street. We love the ambiance of this spot, it’s great for date night or even family gatherings. The menu offers a range of French cuisine, seafood, and salads. The Sunday brunch is also a must-try. If it’s a warm night we highly recommend their patio. Main dishes range from $16.95-$23.95. (Lobster and crabs are based on market price) Reservations are available. If you want the shortest walk to your DPAC show and great food, this is the spot for you. Located in the building that houses DPAC and Aloft Hotel, Nanasteak offers all the steakhouse classics with their own unique feel and taste. The reviews are right- this place is all it’s cracked up to be. Entrees range from $19-$42, with the Dry Aged, Prime Bone In Rib Eye for Two being the outlier for $82. Reservations are available and recommended. Littler consistently tops the top date night restaurants because of their cozy atmosphere and big-bulb string lights that give the whole space a romantic glow. They offer 1/2 priced bottle wine on Sunday evenings and $1 oysters on Mondays. Dinner entrees range from $19-$28. Reservations are available. Bar Brunello is a wine bar located Downtown that’s elegant but casual at the same time. They really know their wine, but they don’t mind if you have no idea what you’re talking about. They’re always happy to make recommendations and you end up with something really amazing. Their food offerings include everything from cheese plates to squid to olives. Glasses of wine range from $9-$21. This is one of those spots you have to visit before you consider yourself a Durhamite. Sipping cocktails and watching the sunset from the rooftop is one of our favorite date night activities. The rooftop menu is lighter and focuses more on snacks. Head downstairs for more of a full menu- The dinner menu ranges from $15-$32. Mothers and Sons features Italian food and is the first restaurant in the South to focus on handmade pasta. The menu consists all of your favorite pasta plus dishes with their own unique twist. You can be adventurous or you can go for straight basic pasta. The menu is written in Italian so you may need to ask for assistance. We looked the menu online ahead of time and used google translate. Main entrees range from $18-$28, with the Florentine steak being the outlier at $85.